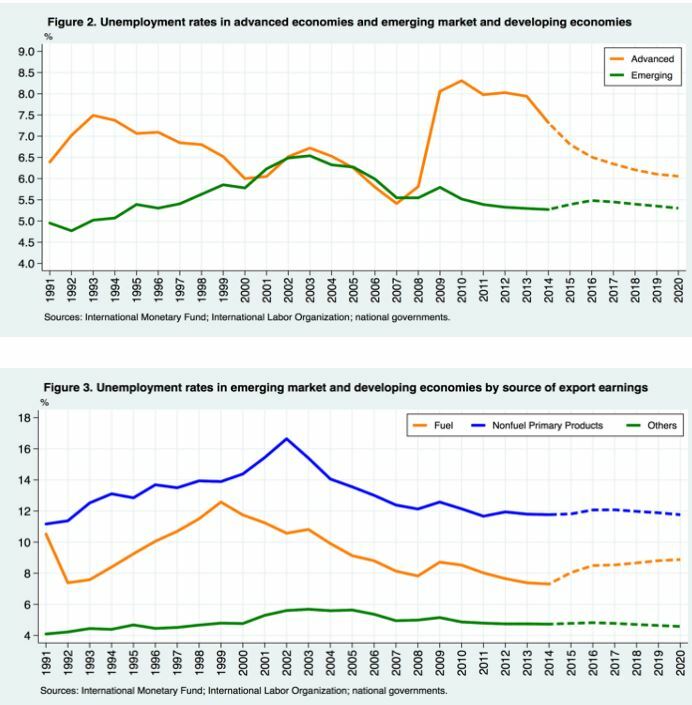 Let’s begin with how the global unemployment picture looked before the IMF’s January 2016 WEO Update. Figure 1 provides a measure of the global unemployment rate based on data for 116 countries, of which 37 countries are classified as ‘advanced’ (i.e. high-income) countries and the remaining 79 as ‘emerging market and developing economies.’ (We refer to the second group using the acronym ‘EMDE’.) Focusing on the recent cycle, global unemployment rate peaked in 6.2 percent in 2009 and has since been returning slowly to its pre-crisis level. Over the coming year, the global unemployment rate is expected to go up slightly. To understand where this increase is coming from, Figure 2 shows the unemployment rate for the two main groups of countries separately. This reveals that the increase comes from the emerging markets and developing countries (EMDE) group. Moreover, the increase in unemployment among this group occurs because of the expected increase in unemployment among fuelexporting countries (Figure 3). How will the growth revisions affect the unemployment picture? Now let’s consider how the revisions to the growth forecasts that the IMF announced in the January 2016 WEO Update could change the unemployment picture. At the global level, the forecast for GDP growth in 2016 was revised down by 0.2 percent, which would in turn increase the global unemployment rate only a little bit above the path projected in Figure 1. 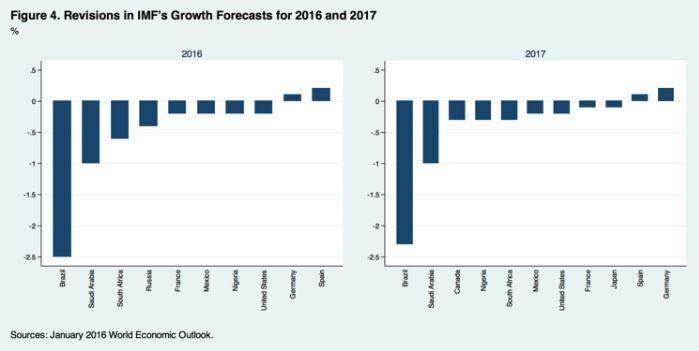 However, for some countries the revisions in growth forecasts are larger, as shown in Figure 4 below. The biggest change is in Brazil, followed by Saudi Arabia, South Africa and Russia. Let’s begin with how the global unemployment picture looked before the IMF’s January 2016 WEO Update. The steady increase in China’s house prices at the national level masks tremendous variation at the city level, conference participants stressed in Shenzhen last month. 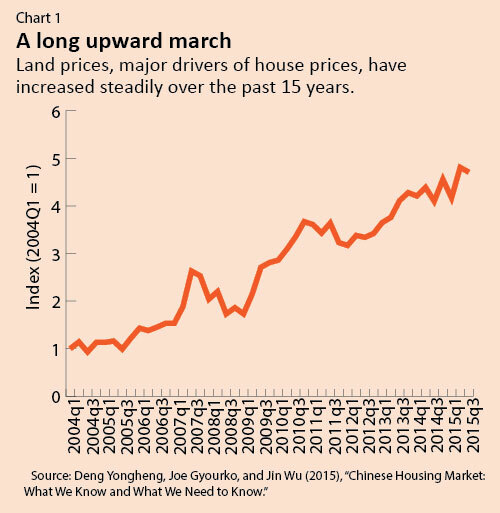 House prices in China have been on a long upward march over the past decade prompting questions about what the future holds (see Chart 1). 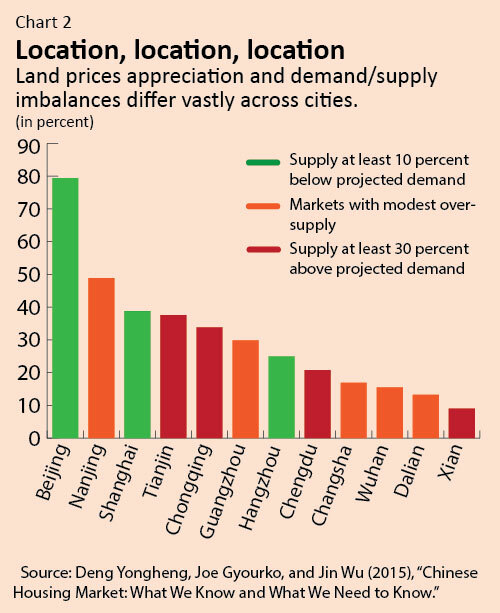 At a conference last month in Shenzhen leading analysts of China’s housing markets provided some answers. Organized by the IMF in cooperation with the Chinese University of Hong Kong, Shenzhen and Princeton University, the conference—International Symposium on Housing and Financial Stability in China—spotlighted new data sets on China’s housing markets, which provide informed views of what might happen next. The conference was part of a series of conferences organized as part of the Global Housing Watch initiative, which also provides a quarterly update on conditions in housing markets. The latest update, released today, shows how China’s house price changes compare with those around the globe. Participants at the Shenzhen conference stressed that the steady increase in China’s house prices (see Chart 1) at the national level masks tremendous variation at the city level. Beijing has “experienced one of the greatest booms ever seen in housing markets,” according to real estate expert Joe Gyourko (University of Pennsylvania), but the situation is different elsewhere. With his co-authors, Gyourko has constructed a residential land price index for 35 large cities in China based on government sales of land to private developers. These data show that prices have increased in inflation-adjusted terms by about 80 percent a year in Beijing over the past decade but by only 10 percent a year in Xian (see Chart 2). If we aggregate real house prices across countries and look at the big picture, we see that global house prices continue to march slowly upward. 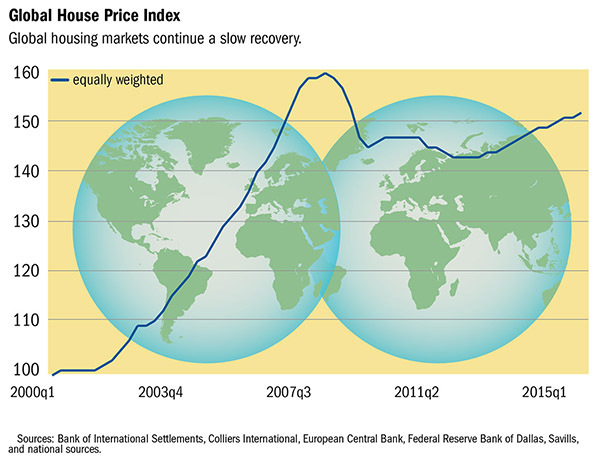 This is what we observe in the latest update of the Global House Price Index (Figure 1). The index has continued to edge higher for the past sixteen quarters. This upward trend in the Global House Price Index is consistent with the pattern we see when we look at real house price growth across countries. 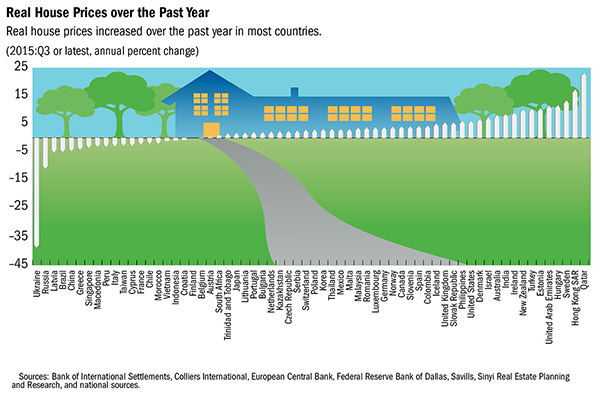 Even though the growth rate varies across countries, house prices are rising in many countries (Figure 2). Moreover, there is also a clear shift in momentum when comparing house prices in 2015 vs. 2009—the peak of the global financial crisis. We can see this by comparing the proportion of countries with either positive or negative real house price growth for both periods (Figure 3). Specifically, the share of countries with positive real house price growth has gone up from 24 percent in 2009 to 75 percent in 2015. 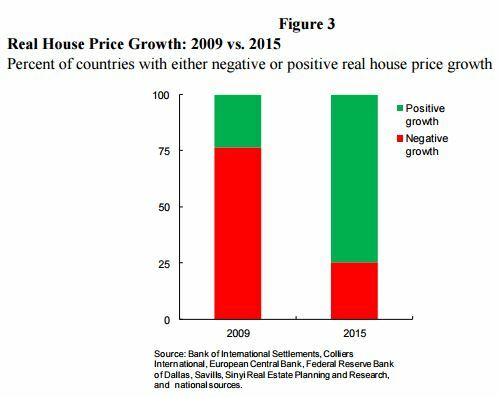 And we see the opposite, when we look at the proportion of countries with negative house price growth. Here the share of countries with 3 negative real house price growth has declined from 76 percent in 2009 to 26 percent in 2015. However, it is important to note that global growth has slowed recently, especially in emerging markets. So it will be important to monitor the data in upcoming quarters to determine the impact on the uptrend in global house prices. Continue reading the report here. This upward trend in the Global House Price Index is consistent with the pattern we see when we look at real house price growth across countries. But as Drum noted in the Economist article, “Despite forecasters’ best efforts, growth is devilishly hard to predict”. Last year, in September, my presentation at the Federal Forecasters Conference summarized my work on the inability or unwillingness of forecasters to predict recessions. I suggested that to get forecasters to predict recessions (even inaccurately) we should have a Stekler Award for Courage in Forecasting. The award would be in honor of noted forecaster Herman Stekler who says that forecasters should predict recessions early and often and that he himself has predicted 9 of the last 5 recessions. April 2014: “There will be growth in the spring”: How well do economists predict turning points? Last year, in September, my presentation at the Federal Forecasters Conference summarized my work on the inability or unwillingness of forecasters to predict recessions. Please bear in mind that this is intended to be a summary of views of external analysts and should not be attributed to the IMF. What are the new policies that the UK government announced? Will house price head north or south? What are the likely implications? 1. What are the new policies that the UK government announced?The short answer: a series of measures to ease house prices and boost the housing supply. The long answer: in November, the UK government announced three new policies for the housing market in its joint Spending Review and Autumn Statement. First: a new Help to Buy equity loan scheme for London will give buyers 40 percent of the home value from early 2016, as opposed to 20 percent. Second: help people get on the housing ladder through Help to Buy: Shared Ownership scheme. Third: from April 2016, people purchasing additional properties such as buy to let properties and second homes will pay an extra 3 percent in stamp duty. Moreover, in January, the House of Commons approved additional measures to boost housing construction. 2. Will house prices head north or south? The long answer: “Government initiatives to support home ownership and build new houses will fail to have any real impact in 2016, with UK property prices expected to keep climbing”, according to a recent Financial Times survey. The survey asked 88 economists the following question: What effect are government policies likely to have on the housing supply and demand in 2016? How much will they contribute to likely changes in house prices? The result of the survey is consistent with other data showing a similar upward trend in house prices. According to another survey, there is a pick-up in both activity and price expectations reflecting a rush to purchase Buy To Let properties ahead of the change in the Stamp Duty in April, according to Simon Rubinsohn at Royal Institution of Chartered Surveyors. Moreover, “The housing market has enjoyed some smooth sailing in the past year, with a steady 6.6% growth in house prices during 2015 (…) If the current speed of house price growth continues into 2016, the value of the average home may soon pass the £300,000 watermark, having reached £250,000 in December 2013”, according to LSL Property Services/Acadata. The latest numbers from Halifax, Knight Frank, and Office for National Statistics also points to an upward trend in house prices. 3. What can be done? The short answer: it is complicated. The long answer: on one hand, there seems to be a consensus among the experts that rising house prices is a concern and that there is not enough housing supply. On the other hand, there doesn’t seem to be any consensus on what the best way is to deal with rising house prices and expanding the supply of housing. 4. What are the likely implications? The short answer: among other things, rising house prices will likely lead to bigger mortgages and more affordability problems. The long answer: Mortgages that extend over 35 years are now quite normal and may even overtake the traditional terms of 20-25 years (Halifax). “All else being equal, it’s an odd trend. Interest rates remain at record lows so it should be easier to afford a shorter tenure for your borrowing”, says Patrick Jenkins of the Financial Times. “But of course all else is not equal. The cost of the average home jumped again last year by more than 6 per cent, and in London by more than 11 per cent. To cope, home buyers are borrowing higher sums over longer periods. For the same monthly repayment, you can fund a 20 per cent bigger mortgage if you borrow over 35 years instead of 25”, according to Jenkins. In 2014, Andrew Bailey of the Bank of England pointed out that if mortgages extend into retirement when incomes fall “we have a long-term problem”. Moreover, “property is set to become even more unaffordable going forward”, says Simon Rubinsohn at Royal Institution of Chartered Surveyors. “So building more houses is the key to solving the problem, right? — Well, not exactly. It only works if house builders build a glut of homes that people can afford”, notes Lianna Brinded at Business Insider. More recently, UK ministers have been criticized for broadening the definition of affordable housing. The new definition “(…) includes so-called starter homes costing up to £450,000 — 17 times the average British salary” (Financial Times). Meanwhile, Politico says that what “(…) should worry those in Brussels who desperately want the U.K. to stay part of the EU is its housing market. (…) In broad terms, there is a shortage of good quality affordable housing, particularly in the southern half of England.” Finally, the New Economic Foundation takes a look at the human cost of the housing crisis. “12 months of growing crisis”—that’s how the Guardian summarizes the housing market developments of 2015. This could partly explain the recent housing market measures announced by the UK government. However, experts doubt that these measures will have any effect.